Wow. Tannis Kobrinsky, owner of Pilates and Arts, sure knows how to throw a party! 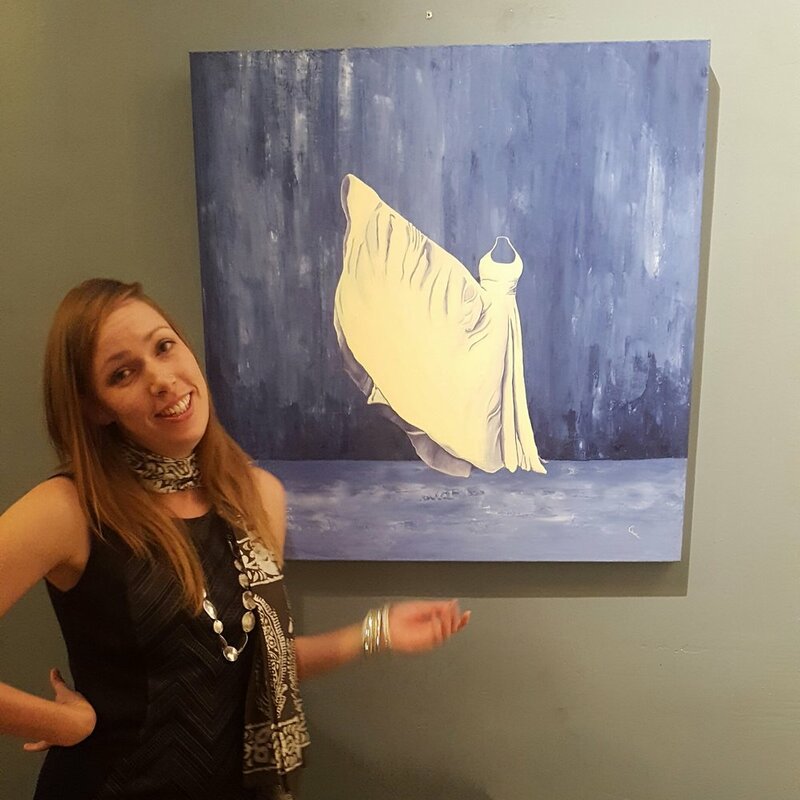 In celebration of the 5th year anniversary of her pilates and dance studio that also doubles as an art gallery, Tannis invited myself and 3 other artists - Nicole Fournier, Mara Zaslove and Miki Berman - to display our art in a group show that we called "Bold Beauty." Christine Rasmussen in front of her painting, "Phenomenal Woman"
Mara Zaslove in front of her photography series, "Ageless Beauty"
The opening was a festive affair, packed with art lovers coming to enjoy each artist's interpretation of the theme - in photography, encaustics, watercolors and oil paints. This event couldn't have come at a better time when community and solidarity are so important. The turnout with the facilitation of a gorgeous spread of snacks, mean mojitos mixed by Wendy Storch and live music provided by Chuck 'n Annie was like a comforting, warm blanket. I showed work from my Flawless series, which is about refusing to apologize for femininity, recognizing that pretty isn't weak. I developed this series in 2014-15, and added some new work for this show, including my biggest piece in the series, Phenomenal Woman. View available originals here and prints here. Missed the opening? Never fear - the show is up through January 25, 2017, viewable by appointment. Contact me to set up a viewing, and "Like" my Facebook page to be notified if we do an Artist Talk Closing Event (details still being worked out).